A file with the AC3 extension is known as the Audio Codec 3 file and this is very similar to the MP3 audio formats. This format file is used to reduce the original size of the file. AC3 extension file is developed by Dolby officially. This format files are good to use if we think about the sound but this is not much popular and supported by very less media players. You can’t play AC3 files in the iPhone, iPad, apple TV and iTunes but AAC files can be decoded in these players. That is the reason why people want to convert AC3 to AAC format. If you are looking to convert AC3 to AAC or other formats then you can read this tutorial. 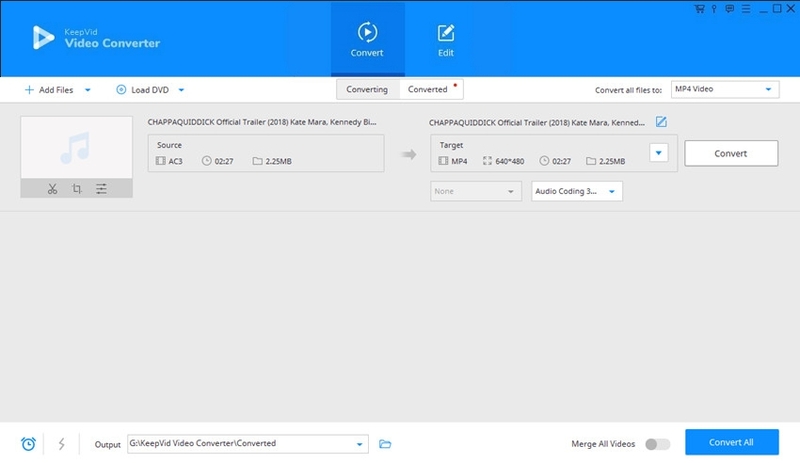 KeepVid Online Video Converter website fully supports AC3 file conversion to the AAC format. This online converter website can convert the audio, video in more than 60 formats without any charge in your browser. This converter website is very easy to use and provides you a very easy and convenient way to convert the files. You can also choose the file output format from list of devices name on the website so it will directly convert the files in the selected device compatible format. 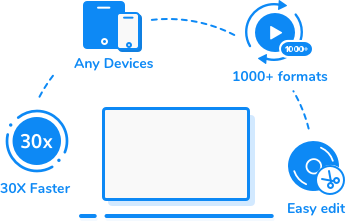 KeepVid Video Converter software is especially designed to convert the audio and video files in the popular audio and video formats. This is a very powerful converter program that gives you high-quality output after conversion. If you want to extract audio from the videos then also you can use this program. So finally it can definitely convert AC3 to AAC very quickly. It is developed for the windows and Mac both users.  Convert video files or extract audio from videos to more than 1,000 formats. Edit videos and customize the video files in accordance with your preferences. Convert multiple videos in a batch easily. 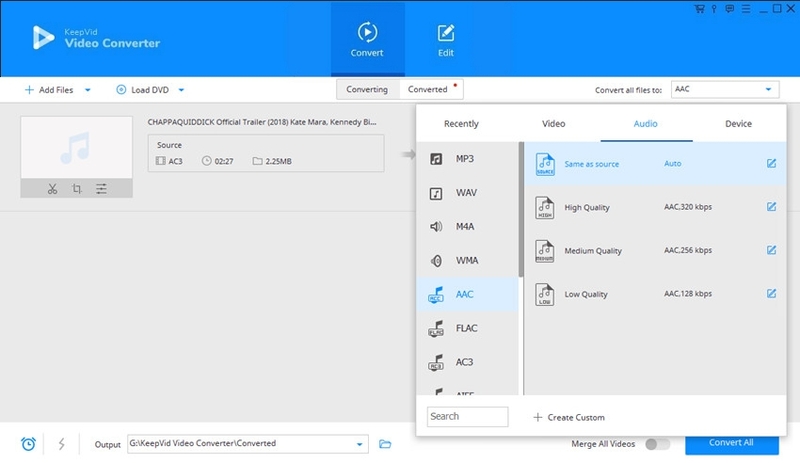 Step 1 – Start KeepVid Video Converter and add the AC3 file from your computer. Step 2 – Click the menu icon at the upper right side and choose AAC as an output format. Step 3 – Click Convert button to start converting AC3 to AAC files. Firstly, install and launch the converter program on your system. Now drag and drop the video files into the program directly, or click the Add Files button to add the video. Click the upside down icon in the top right side next to “Convert all files to” and select AAC from the audio tab of drop-down menu. Once you have selected the format, click the “Convert All” button at the lower right side of the convert tab interface, and the program will start converting AC3 to AAC files. AAC extension file is also known as Advanced Audio Coding. This format is jointly developed by Bell Labs, Fraunhofer Institute, Dolby Labs, Sony and Nokia in the 1997. AAC format was developed the successor of the MP3 format. This format gives you high quality sound output than compared to the MP3 format and the file size of this format is very small than the MP3. With the less file size it can maintain the high quality sound at the same time. You can use this format to play the files in the nice audio on the amplifier systems.